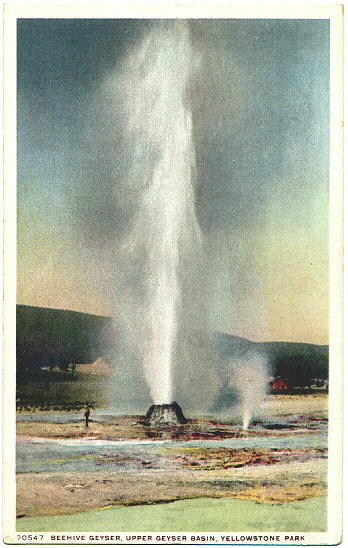 Named by the 1870 Washburn Expedition for its distinctive 4-foot tall beehive-shaped cone, this popular geyser is one of Yellowstone's tallest, erupting between 150 and 200 ft, with a duration of about 8 minutes, including the final steam phase. Beehive is prominently located in the Upper Geyser Basin, within view of the Old Faithful Inn as well as other attractions in the Old Faithful area. During most of its known history Beehive's eruptions have been irregular and many days apart, but in the early 1970s it began more frequent eruptions, and played almost daily well into the 1990s. Since that time its eruptions have been almost always preceded by 10 or 15 minutes with a much smaller "Beehive Indicator" that spouts from a vent a few feet away from the main cone. Nearly 100 years ago, lecturer John L. Stoddard observed "...half a mile away, the Beehive Geyser threw into the air a shaft of dazzling spray fully two hundred feet in height. I realized then, as never before, the noble action of our Government in giving the incomparable region to the people."